A few months ago Nick from the Yeast Bay sent four Brett strains (1B, 2B, 3B, 4B) he isolated to the Beta Testers (Marshall, Brian and I) to test in both a 100% Brett primary beer and secondary a portion from our Saison strain Beta test round. This post has been a long time coming, maybe I've been subconsciously holding off on sharing it as it's a partial failure on my part but I still wanted to share the experiences. The 100% Brett batch recently went down the sewer which is no fault of the Brett strains themselves, or Nick of course. All four variants (Same wort split between four 100% Brett Primaries) exhibited a really harsh, unpalatable character that I'm having a tough time describing, but it was a complete dumper. 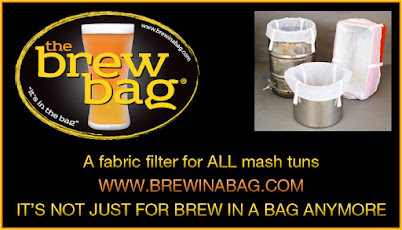 I sent Nick a bottle of each and he had the same impressions, as far as I know the batches Marshall and Brian brewed did not exhibit this issue so it was likely a cold side snafu in my process. I just wish I could pinpoint the mistake, but I think something may have happened when prepping the starters. Before anyone suggests I should have blended it, or any other attempts at saving 10 gallons of crap beer, just don't, it truly sucked that bad. I've learned my lessons on blending down bad beer in the past and don't care to make that mistake again. This is something that comes with the territory when brewing such experimental beers like this, some hits and some misses better to move on a brew more. On to the more positive results, the same four Brett strains were used in a split batch secondary test as well, which went much more smoothly than the primary. If you go back and look at our analysis of the four Saison strains Nick sent us you can get a little more background. I was to rack a portion of the batch fermented with Saison strain #2 (Saccharomyces), which was heavily under attenuated finishing at 1.020. Low AA% is a characteristic all three of us experienced with this strain with mine finishing the highest. Despite the under attenuation the beer was actually pretty interesting exhibiting some sourness and enticing phenolics. With the high level of residual sugar left I was more than happy to add some Brett and let it dry out. I racked a portion of the Saison into four separate one gallon carboys for a secondary fermentation where I added a 30ml vial of each Brett strain into their own carboy. It was pretty amazing to watch fermentation as they all kicked off within a week of pitching and were highly active creating a thick krausen in secondary. Each variation hung out in secondary for 5 months, with strains 1B and 2B finishing up first but all of them going into bottles at the same time. I was very surprised to find that all four strains attenuated the beer down to 1.012 on the nose, still not very dry for a Saison but plenty of attenuation for me to evaluate the strains contributions. Light clove, allspice, very delicate, could fool me that this is a Brett beer. Some tartness, like the clean batch, there is a residual sweetness that's distracting but the tartness come back in the end to clean up. If it were drier it would be really nice. All the credit goes to Saison strain #2 for this one though, not sure this Brett strain is bringing much to the beer other than additional attenuation. Highly carbonated, huge rocky head, the most carbonated of all four. Phenolic-y, hay, grainy, some pepper, not funky either, another subtle beer. Tart again upfront, the lingering sweetness is not present in this one, appears to be more dry than it is but more body than you want in the style, it's simple but pretty refreshing. Great peppery nose, most Saison like in aroma, a bit earthy, mushroom, background musty basement like aromas. Nice carbonic bite on tip of tongue, not as tart as 1 or 2 but it's balanced by some nice spicy notes. It appears more dry then it is but more body than I would want, the residual sweetness is there but not distracting. So far this is the best. Crystal clear, not much aroma, I get malt, slight citrus/lemon, no hops. Very subtle acidity, fuller body than all 4, pretty clean, not much here, bordering on bland and boring. Wish I had more to say about this one but there just isn't much here. All four of these Brett Secondary Saisons are decent beers, So long as you can see past the high levels of residual sugar. Strain 2B and 3B are really the only ones that I think I would use again, but would still benefit being blended with another Brett strain for complexity as they are alone they are interesting but maybe not strong enough on their own. Pouring the 2B and 3B Saisons in a 50:50 mix in a glass and it proved that point for me.However, strains 1B and 4B inexplicably brought very little to the finished beer, I could serve them both to someone and they would never know it was a Brett secondary beer. I do not plan to use either of those strains again. I'm not sure if Nick plans to sell any four of these strains but I do think that adding 2B or 3B into a Brett blend, or a new Saison Brett blend, would definitely be an interesting product. The biggest take away from these trials is that the Saison (Saccharomyces) strain #2 is a very very unique strain. After chatting with Nick and the other Beta testers we all agree it would be a perfect strain to add to a sour blend. It somehow exhibits a nicely tart beer without any LAB (Lactic Acid Bacteria) added and is a low attenuator leaving plenty of residual sugars for few Brett and LAB strains to clean up and acidify. But who knows, maybe it doesn't even need the LAB added. Whether it's added to The Yeast Bay line or not I have propped it up and added it (and 2B/3B) to a blend I am playing with at home, currently I am leaving the LAB out to see how it does without it. 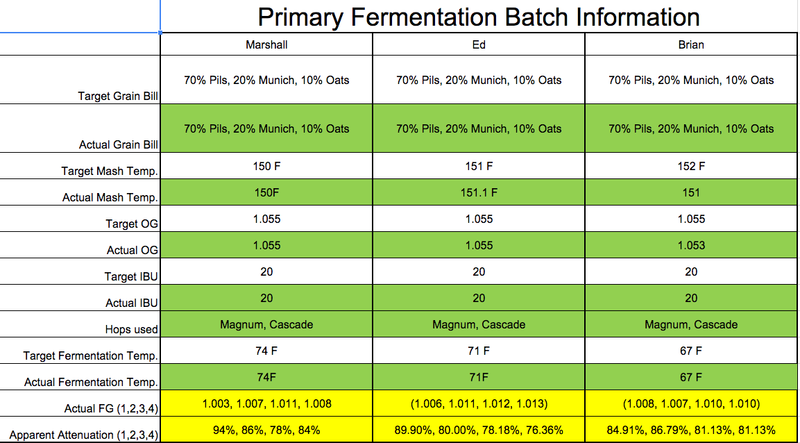 Vitals for the Brett Primary Batches.